Clancy Construction completed a state of the art Central Decontamination Unit on the grounds of Cappagh hospital in Dublin. 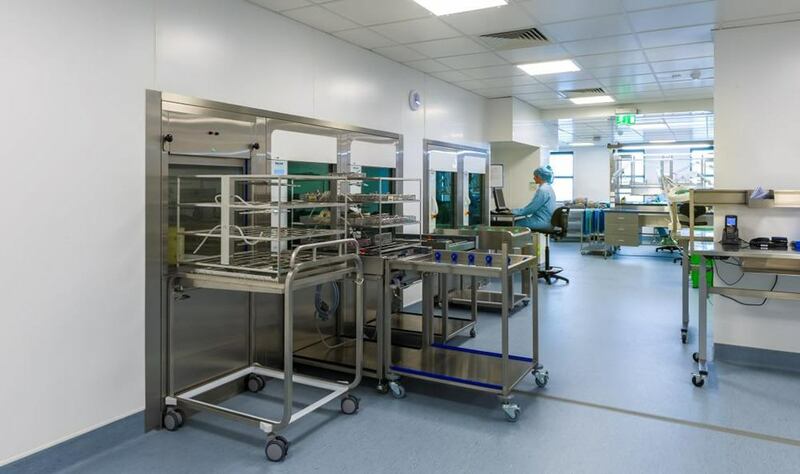 The facility run by Zehnacker Healthcare Ireland is the first of its kind in Ireland and offers decontamination and sterilisation services to the broader healthcare sector both private and public from this easily accessible location. This Clean Room facility achieved ISO 14644-1:2009 certification Class 7 and Class 8 in another area which exceeded the requirements of the current regulations for this type of service. The fit out and refurbishment of the existing St. Michael’s Hall total area 650 sq metres including minor extensions; Completion of the fit out, completion of services and finishes to the CDU unit at ground floor level; The fit out and services for the first floor as consulting rooms for the Out Patients Department; Replacement of roof finish to St. Michael’s Hall and adjoining flat roof areas; Alterations and replacement of existing external steel escape stairs and provision of new link corridor over roof to existing OPD. Extension for small stores on gable end.